In her powerful and insightful book Goddess Durga and Sacred Female Power, Shakta devotee, scholar, and yogini Laura Amazzone writes that a pilgrimage begins the moment you decide to undertake it. For those who embark on their journey with conscious intention, yatra (pilgrimage) has a profound effect on consciousness and has the power to transform your life. True yatra is a process of getting out of one’s own way, to listen deeply and expand our awareness, compassion, and consciousness. As I had written about previously, I had to cancel a long-term pilgrimage journey that had been planned for months because I was at death’s door. Talk about cultivating detachment! Fortunately, MAA was with me every moment and the experiences I had during my recovery were precious and enlightening. By MAA’s grace I was able to embark on the journey I had originally planned, but with new insight and deeper intention. The yatra began from the moment I had decided to go, and included my dance with death. Without it, my actual journey to India would not have been as fruitful or insightful. What is the purpose of pilgrimage? Why do we do it? If MAA is everywhere, then why should we go to a temple or a holy place? The fact is, we are human, and although we are not separate from the limitless expanse of Infinite Being, we are nevertheless living in a world that appears limited. Some places hold great power for shifting our consciousness, perhaps because they are powerful in and of themselves, and perhaps because great souls have done incredible work in these places, leaving their teachings and their examples for us to follow. And the shakti or energy/power of many millions of devotees making their way despite difficulties and limitations to these places to express their sincere devotion, all unifying in a single place, is very powerful to experience, helping us to shift our consciousness even further, and maintain faith in the process. 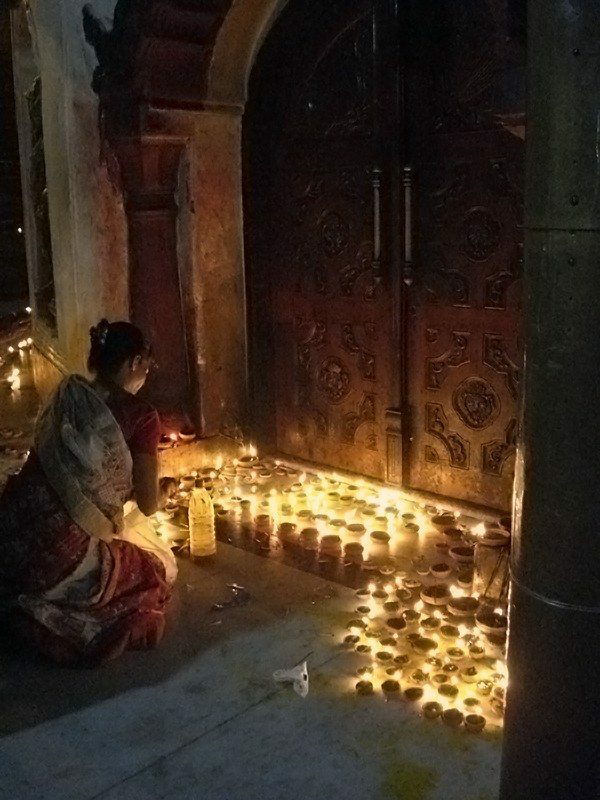 A woman lights diyas (clay oil lamps) during Divali at the Sri Sri Kamakhya temple. Photo courtesy of Kulasundari Devi. Visiting a place like Kamakhya – or any holy place – is a liberating journey. To travel to Kamakhya, to touch her yoni pitham, is to travel to one’s own Divine Source. One of the meanings of the word yoni is “source,” and truly, Kamakhya is the source of all being. This is why the scriptures tell us over and over again that making pilgrimage to Kamakhya is more potent for one’s spiritual journey than making pilgrimage to all the other shakti peethams combined. Because when we go to Kamakhya, when we make not just the physical journey but the true inner journey, when we open to what she has to teach us, then the power to be liberated from limited ways of thinking and being becomes open to us. It requires a kind of ego-less-ness, the capacity to humble oneself, the ability to truly and non-intellectually recognize divinity in every person, place, or thing. And MAA gives us these things, if we are ready to drop all pretense and humble ourselves at Her feet. Yatra, after all, is a quest for power, for transformation, for liberation, for redemption. When we undertake yatra, we are essentially searching for something that we are always carrying with us. True yatra is a process of getting out of one’s own way, to listen deeply and expand our awareness, compassion, and consciousness. If we can be in that consciousness all the time, then every moment becomes a yatra, a pilgrimage to one’s own Source. Undertaking the pilgrimage to Kamakhya, then, becomes an externalized enactment of that internal journey, that constant movement toward Self. Realizing this, we begin to move closer to Infinite Being, which is none other than MAA Herself.